The 4 seats chairlift of Rosières, from this satellite resort provides access to the entire skiing area of Les Saisies (77 km of slopes) and Espace Diamant (192 km of slopes). Thanks to three tracks coming down Mont Bisanne most of Bisanne 1500 accommodations are ski in - ski out. The Planay blue track is fully equipped with snow cannons for comfort and a longer open time during the season. 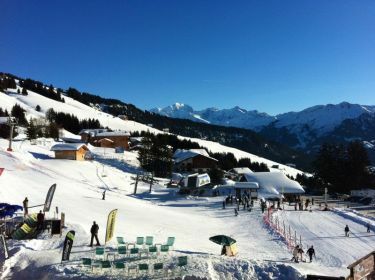 Free shuttles are also at your disposal all winter long between Bisanne 1500 and Les Saisies resort. These were reinforced in previous winters and a new reception area has been set (near Les Fermes du Beaufortain residence) in addition to the existing stop near to Rosières chairlift.